Before I had kids I was all about raw foods. Now that my kiddos are getting older, I am getting back to my roots. I love huge raw salads with delicious dressing! The beauty of raw foods is that the digestive enzymes are intact and help you digest the food. When you cook it, you destroy the naturally occurring enzymes in it which helps digest the food. The more raw foods you can incorporate into your life will equal more energy and better digestion. Even adding a side salad or some crunchy raw carrots to a cooked meal will help because the enzymes will help you digest the food. I would recommend making a double batch of this salad. You can use it for a couple of meals and for side salads with dinner. If you would like to add protein to this salad, an option would be some sliced almonds. You might be surprised…even without adding any extra protein, one serving has 10 grams of protein in it. It packs 15 grams of fiber and 14 grams of healthy fat (depending on how much dressing you use). To shred the cabbage, I use a food processer fitted with the slicing blade. I use the grater blade to shred the carrots. Makes 2 large salads. Makes enough dressing for 3-4 salads which is great, so you can use it for extra salads throughout the week. Make the dressing by combining all dressing ingredients in a food processor or blender. Combine the salad ingredients, except the avocado, in a large bowl. Thoroughly mix together. Divide into 2 bowls. Add dressing and mix thoroughly. Top with some avocado. Let sit for 10 minutes before eating. The dressing will soften the veggies making them easier to chew and digest. 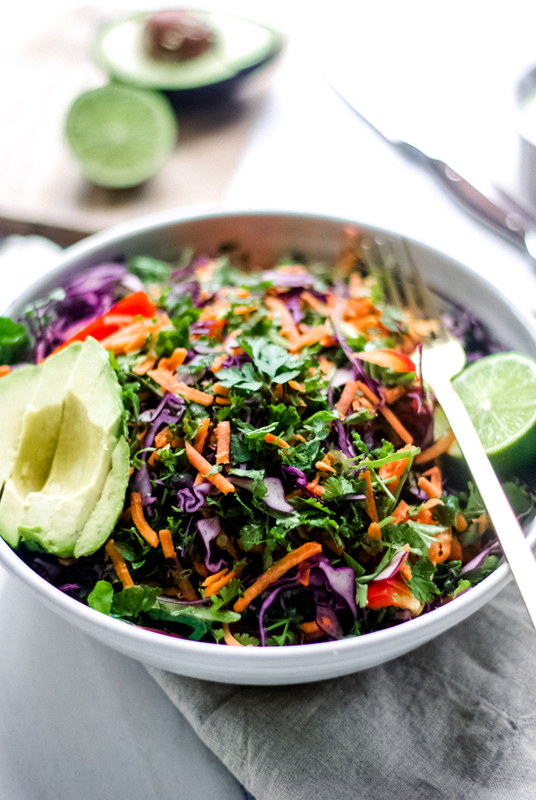 Pictured below is another version of the detox salad with shredded kale instead of green leaf lettuce.